Doubleheaded steam at 'The Narrows.' Fall colors. What more can you ask? The only thing this photo really lacks is the sound two K-36s make working upgrade. It’s almost like that with the tourist railroads on the Trains Tour of Colorado. Almost. Every one of these railroads has something to recommend it, and I enjoy every one of them. But I must admit I have a favorite child: the Cumbres & Toltec Scenic Railroad, a 64-mile railroading time capsule that is as close to a narrow-gauge operation from the 1950s (or ’40s, or ’30s) as is possible in an era of cellphones and microprocessors. If anything, I love it even more after today’s trip. One thing we’ve added from earlier versions of the Trains tour is a bus-chase option on the Cumbres & Toltec. For the first portion of the trip, from Chama, N.M., to the top of Cumbres Pass, our guests had the option of riding the train or taking the bus, which would make several stops to shoot the train as it passes, with a representative of the railroad helping to guide us to the best spots. Since the C&TS’s climb out of Chama includes grades of up to 4 percent, it’s not hard for the bus to get ahead of the train several times. I know many of those on the tour were conflicted whether to ride the train or chase it. My recommendation was that those who had never been on the C&TS before should ride the train, because I remember how much I enjoyed watching and listening as it worked to the absolute limits of its abilities to reach the top of the pass. Those who had visited before might still want to consider riding, I said, particularly taking the weather into consideration. I guess I was pretty convincing, because we only had two of our 42 tour members chose the bus chase, which I had known I would be part of as part of my responsibilities in helping lead the group. What I hadn’t known was that the railroad’s representative would be its president, John Bush. If the bus chase hadn’t yielded a single quality photo, it would have been worthwhile just to hear Bush — who returned to the C&TS as president of the C&TS in 2012 after a previous stint as assistant general manager and chief mechanical officer — talk about his railroad. 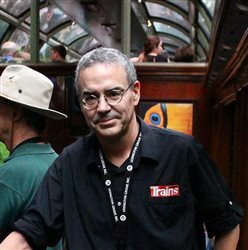 He is justifiably proud of the Cumbres & Toltec, with great insights about its operations, its history, and its goals for the future (which include financial self-sufficiency in the near future.) I learned quite a bit about the railroad; I think all three of us on the bus really enjoyed the chance to talk with John. But, of course, the bus chase generated a number of great photos of our 13-car train, which required doubleheaded power to the top of Cumbres Pass. When you have the president of the railroad guiding you, you better believe you’re going to end up at good spots. Add in some vibrant fall foliage, and we’d had a terrific day even before we got on the train. And once on board, there was still plenty of time to enjoy the C&TS experience — which I have and will continue to wholeheartedly recommend to anyone who loves railroading. So, even with my always-high expectations for the C&TS, my “favorite child” exceeded them. I suppose that might explain why it’s my favorite.